Large beautiful garden, stunning views of the Sea of Cortes and the Mountains! An ideal location near the Loreto marina! 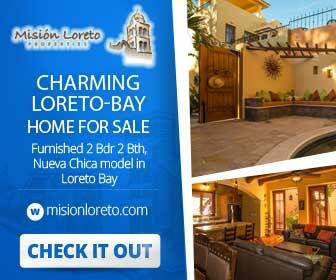 This property is a gem in Loreto! The location can’t be beat if you love being on the Sea of Cortes…. literally steps from the marina with lots of room to store a boat, kayaks and more! It has a beautiful large garden with drip system and installed solar lighting which creates magic in the evening. This home is solidly built with concrete beams and brick walls and the systems (plumbing and electrical) have been renovated by the current owners over the last few years. There is a lovely covered front porch which is perfect for taking in the view of the large garden at anytime during the day. Downstairs is comprised of the kitchen, (with windows on two sides which invites the sunlight to stream in), the dining and living room, (which has large glass doors that face the covered porch and the garden), a full bathroom and laundry area, and a newly renovated bedroom. This bedroom has tiled floor and wood and glass french doors that lead out to a private natural stone patio and the garden. The upstairs is a loft and is made up of the master bedroom and an additional full bathroom. A large window in the bedroom also frames the garden view. From outside the second floor, there is a staircase which takes you up to the third story terrace, which is open on all four sides, and has stunning views of the Sea of Cortes and the Mountains! This terrace has a tiled floor and a new palapa roof and plenty of room for entertaining! The property has a tall concrete wall around all sides and a wide iron gate and concrete parking area for cars and boats. There is a new palapa covered carport and an enclosed work shed, and a fish cleaning station/gardening area. A lovely fountain in the garden draws in groups of birds during the day. At the far end of the garden, there are RV hookups and another hook up to the city sewer, should you want to expand and build an additional home. There are many options! Contact Jill Jackson at jill@misionloreto.com for more information about this great property!